Thales has launched a shipboard on-the-move multimedia system designed to support secure information distribution for deployed naval personnel with continuous mobility and connectivity services. 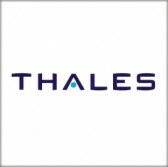 The COMTICS communication device works to connect with all types of military radios, utilizes Thales’ cybersecurity technology and employs a redundant all-IP architecture to maintain service availability, the company said Wednesday. Christophe Dumas, vice president for radio communication products at Thales, said the product will serve to address quality-of-life as well as operational and security challenges facing deployed naval personnel. COMTICS resembles a smartphone and offers services including video and data transfers, web browsing, online internal communications and access to social media when the operational situation allows. Thales noted the device can handle up to 3,000 simultaneous calls and is built based on its NGIN Naval Voice Over Internet Protocol and Fiber Optical Communication Network platforms that are currently in use with 15 naval agencies. The shipboard system is designed to support installation within weeks under a legacy system upgrade and to operate amid a harsh naval environment, the company added.